Some people search for the perfect wave or the perfect song, but I search for the perfect cheeseburger. 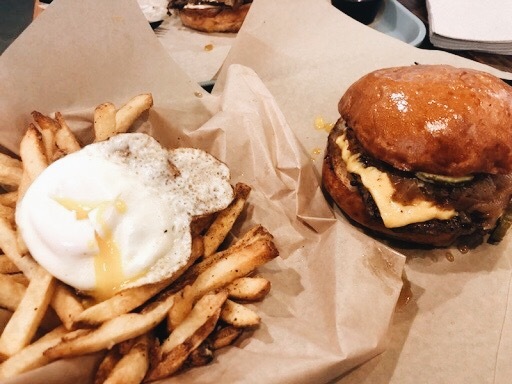 This past week, I was inspired to investigate the quality of the cheeseburgers at the restaurants Zov’s and Graze, located in Orange County. Both of these establishments take pride in their meat patties, but I was determined to find the x-factor. To me, the most spectacular substance in the world is the classic cheeseburger. This simple food possesses the quintessential needs any good food requires. When I eat a cheeseburger, I look for a chance to be sloppy. No umami food can be eaten politely; you have to be able to dive in. I also need to be able to taste the individual delights from each of the cheeseburger components. The tomato must be fresh and the lettuce crisp. The cheese must be gooey. Without question. The patty must produce juices that will dribble down your arm, even if it makes you cringe. And the bun, oh, the bun; it must be fluffy, and yet sturdy: able to hold the goodness together. I was hoping that Zov’s and Graze would be up to the test. Zov’s, located in Tustin, is known for their elegant lunches and their top-notch Mediterranean food, so my expectations for a cheeseburger were low. However, I departed the visually stunning restaurant with high hopes and barely any disappointment. Fancier than most cheeseburger joints, Zov’s nailed my list of requirements when it comes to a good burger. They were able to combine the fresh veggies and the salty meat perfectly. The cheese melted well, however, I would have preferred the dairy confection to ooze a little more. Overall, I was pleased. A side of fries to munch on fulfilled the beautifully arranged meal. Plus, it is not every day you eat a burger beside a bubbling fountain. Deep in Santa Ana is a foodie’s fantasy, called the 4th Street Market. This collection of small restaurants share a space that utterly fills the customer’s expectations. Not expecting much, I tried Graze. From the outside, Graze didn’t look like a cheeseburger paradise. However, the moment the cheeseburger touched my lips, my thoughts transformed. Suddenly, I was holding the holy grail of all cheeseburgers. Caramelized onions spilled out of the gooey meat sandwich I was holding. This was no burger—no—this was an edible work of art! Never before had I ever felt this way about food. I devoured it. The slab of meat was complemented by extremely gooey American cheese, a hot fried egg, and lots of tasty caramelized onion. A perfect amount of sauce drizzled down my arm and I had to use every ounce of my self control not to lick it up in order to remain polite. In my expert opinion, I’d say this was the real deal. Ergo, comparing these burgers is a brutal chore. How can brilliant masterpieces such as Zov’s and Graze even be compared? I did my best. I award the level of freshness to Zov’s; their veggies did not frighten me and were surprisingly delicious. I also applaud their general aesthetic and their service. Of the two restaurants, I prefer Zov’s french fries, but Graze has the better burger. To be honest, it was perfect. The sloppy goodness it contained is what any cheeseburger connoisseur searches for. I also want to acknowledge their atmosphere. 4th Street Market’s vibes felt authentic and I enjoyed it immensely. So, next time you want a burger, take a break from In-N-Out. I encourage you to drive to a real burger joint. Whether it is casual or formal, there is a cheeseburger masterpiece for either occasion. These burgers captured my hunger and transformed it into a delicious appreciation.